The Baltimore County Fire-Rescue Academy is an accredited Advanced Life Support (ALS) and Basic Life Support (BLS) Education Program through the Maryland Institute for Emergency Medical Services Systems (MIEMSS). Additionally, the Fire-Rescue Academy serves as a Training Agency for providers to re-certify through the National Registry of Emergency Medical Technicians (NREMT). The FRA is also a credentialed American Heart Association (AHA) Training Center. Captain Danielle Knatz oversees Emergency Medical Services Education Programs. The Fire-Rescue Academy provides the initial training required for all sworn career members of the Baltimore County Fire Department. Recruits participate in a sixteen to eighteen week non-residential academy which prepares them to be successful once they are assigned to field operations. 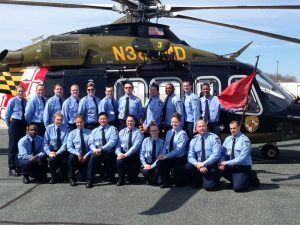 The curriculum is designed to familiarize recruits with departmental policies and procedures, introduce them to a lifetime of physical health and wellness, and provide the requisite training needed to function as an Emergency Medical Technician or Paramedic in the Baltimore County Fire Department. Individuals who successfully complete the recruit training program are awarded college credits through an articulation agreement with the Community College of Baltimore County. As an accredited Advanced Life Support Education Program, the Fire-Rescue Academy conducts an annual course designed to certify providers as a Maryland Cardiac Rescue Technician (CRT). The course, which requires EMT certification prior to enrollment, consists of approximately 600 hours of blended lecture, hospital clinical rotations, and a field EMS unit preceptorship. The ALS program utilizes the Baltimore County Fire Department's Learning Management System to present interactive lectures, quizzing, and submission of course documents. Through an articulation agreement with the Community College of Baltimore County (CCBC), students who successfully complete the program are awarded college credit for the first year of CCBC's Emergency Medical Technology program. Students are given preference to enter CCBC's second year program to become licensed as Paramedics. Paramedic/Firefighter Pam Westfall coordinates the Advanced Life Support Program. Throughout the year, the Fire-Rescue Academy Staff conducts EMS training in support of the field operations division. Biennial refreshers are conducted for the entire department in the spring and fall and satisfy the requirements for an Emergency Medical Technician Refresher Program. The FRA also supports the specific needs of any career or volunteer company upon request. Paramedic/Firefighter Krystal Kelly coordinates the delivery of Emergency Medical Services field in-service training.